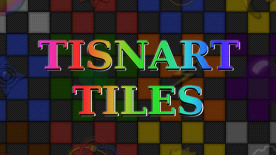 Tisnart Tiles takes you beyond the ordinary match 3 games! Not one board is alike. Power-ups, Bombs, what's next? Look out for Mr.Skull, he wants to steal your tiles. Earn coins to purchase unique items that will aid you along the way. Between the split screens, rotating tiles and earthquakes you are bound to get dizzy. Think you got what it takes? Although there are tutorials within the game, there are many "things" left for the player to discover during game play! The Title is screen is an interactive one....can you figure out all the different things you can do? There may be some secrets in the level select screen for extra coins......can you find out what they are?